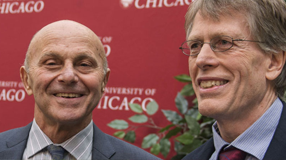 Eugene Fama, MBA'63, PhD'64, and Lars Peter Hansen become the fifth and sixth economics Nobelists on the current faculty. James and Paula Crown's $10 million gift supports Urban Education Institute initiatives in Chicago and around the country. Administration building named to honor former University provost, president, and US attorney general Edward H. Levi, U-High'28, PhB'32, JD'35. Chicago Innovation Exchange to open on 53rd Street, offering scholars and entrepreneurs a launching pad for products and start-ups. Daniel, JD'84, and Alisa Doctoroff, MBA'83, inspire a Law School initiative to teach lawyers how to create, not suffocate, business. Crime Lab director Jens Ludwig says a mandatory-sentencing law for illegal gun possession would "pay for itself five times over by preventing violent crime." How big and tall are NFL players? Astrophysicist Craig M. Booth created a graph that illustrates the average and extreme sizes in professional football. Seventh Circuit Judge and Law School lecturer Richard A. Posner says he was wrong in his majority opinion upholding an lndiana law. Benerito, PhD'48, was a government chemist who helped develop wrinkle-resistant cotton. How a UChicago student (d)evolves into a being almost purely of thought. What famous person did you meet in the College? Did you date Paul Butterfield? 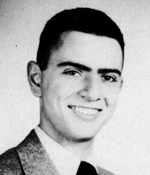 Room with Carl Sagan? Did Gertrude Stein give a guest lecture in your Hum class? 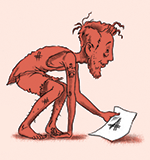 Send your stories to uchicago-magazine@uchicago.edu. As part of the 2013 Dean's Challenge, Chicago Harris students present ideas about ending homelessness in the city.